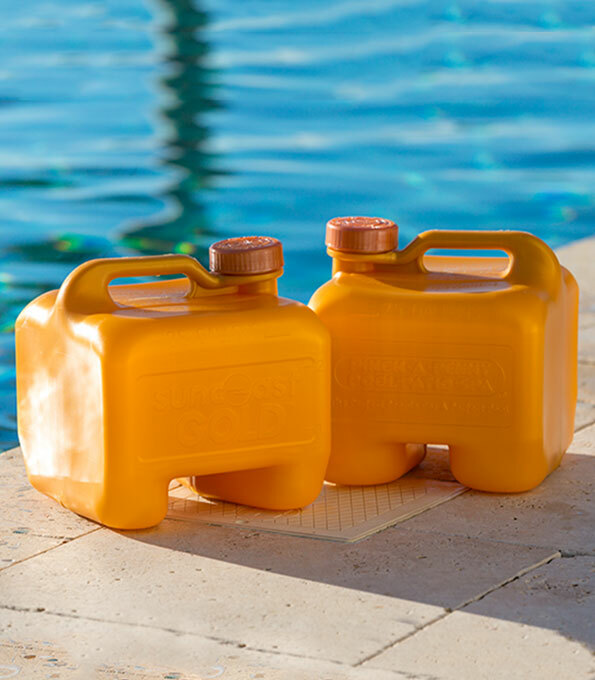 Even with normal use, many unwanted items can be introduced to (and potentially harm) your pool. These items can prevent chemical treatments from doing their job, make the water unhealthy or unappealing, or all of the above. The two most important things to remember about healthy pools are that they must be sanitized and they must be balanced. The most efficient way to sanitize your pool and keep swimmers safe is with chlorine. Bacteria from swimmers' bodies, rain, debris or animals can enter and contaminate pool water. All of these are reasons for using chlorine or another sanitizer. A "balanced" swimming pool means keeping the five basic pool water components (total alkalinity, pH, calcium hardness, stabilizer, and total dissolved solids) within their proper levels. These components work together to help the sanitizer work more effectively. That's why sanitizing and balancing are equally important in having a healthy pool! Remember, water balance is constantly changing - test your water weekly! Total alkalinity refers to how much alkaline is in the water, but you can't fully know the importance of total alkalinity without referring to pH because the two influence one another. Low alkaline water leads to low pH and high alkaline water leads to high pH. A pool should have a total alkalinity level of 100 ppm. Keeping your pH levels within the proper range is important for both swimmer comfort and keeping your equipment and finish in good condition. pH refers to the acidity or baseness of your pool water. A proper pH level is in the range of 7.4 to 7.6 on a pH test kit's numeric scale. The scale has levels from 0 to 14. 0 to 7 reflects a low or acidic pH, and 8 to 14 means the pool has a base pH level. Low pH readings mean your chlorine will dissipate quickly, whereas high pH levels make chlorine inactive. This means that the money you're spending on chlorine is, unfortunately, wasted. The right amount of calcium in pool water is crucial. Too little and your pool's surface can begin "chalking" and erode. Too much and your water could become murky, scale formations could appear, and stains might begin to form. 200 to 400 ppm is the general range for calcium hardness levels. Stabilizer is important because it helps your pool retain chlorine longer. Stabilizer is added to some types of chlorine to protect it from breaking down due to the harmful effects of U.V. rays. When your stabilizer level is low, you'll go through a lot more chlorine than normal. When it's high, you may need to dilute your pool water to bring it back into the normal stabilizer range, which is between 40 and 100 ppm. All water, except for distilled water, contains dissolved minerals. When pool water evaporates, the minerals get left behind and become concentrated. As evaporation continues day after day, the water will retain more and more concentrated minerals. Minerals in pool make it hard for chemicals to do their jobs, which gives stains a chance to form. If you have a level of 3000 ppm or more of total dissolved solids (TDS), drain some water and add fresh water. Balancing your pool water and keeping pool chemicals in their ideal ranges will help ensure that your water will not harm your swimming pool or swimmers! Keeping Your Pool Sanitary What's the best way to keep your swimming pool clean and healthy?